Summary: The Bestway Lay-Z-Spa Hawaii HydroJet Pro Inflatable Hot Tub is an excellent investment for your unique needs. This is because the tub is simple to set up and provides sufficient room for as many as four other people to enjoy the water. 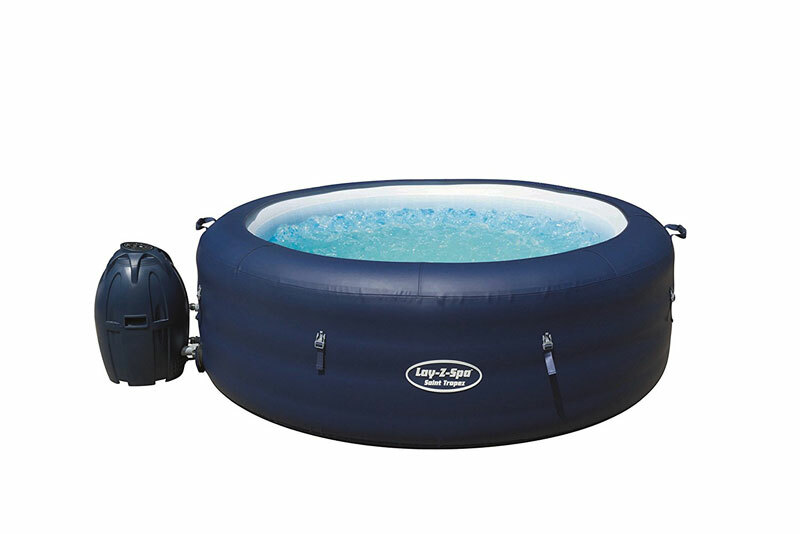 Discover the brilliance of the Bestway Lay-Z-Spa Hawaii HydroJet Pro Inflatable Hot Tub that is ideal for users of different body types and it can be able to accommodate as many as six average sized individuals with ease. It also comes with benevolent additions such as cushioned floor and two ergonomic lifting handles for added user convenience. Pamper yourself in the warm and soothing water with the Hawaii HyrdoJet Pro Inflatable hot tub that comes with as many as eight adjustable hydro jets that provide a relaxing massage with the simple touch of a button. This highly versatile spa is suitable for as many as six people and is simple to set-up either outdoor or indoors within minutes without the conventional hassles that come with setting up a spa. 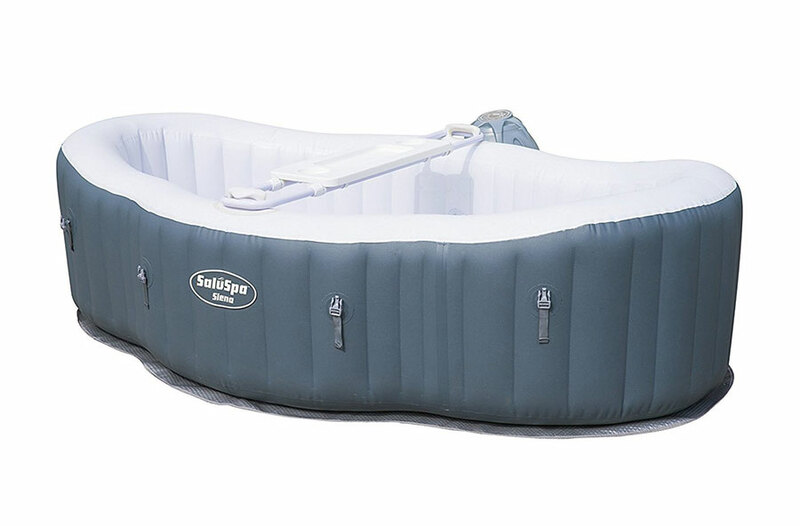 It can also conveniently inflate just by using a spa pump, and it also features a Lay-Z Massage system, water filtration system and rapid heating system to provide you with everything you would need in the ideal hot tub. On top of that, it also comes with an in-built water treatment system that makes the water gentle on the skin for a soothing and refreshing encounter in the water. The inclusion of the airjet nozzles provides an excellent flow of water with the tub for a soothing and refreshing experience each time. To be specific, it comes with as many as eight adjustable nozzles that provide a calming effect on the uses skin especially if the water is set at the ideal temperature. What is more remarkable is that the water filtration cycle is highly efficient and helps to ensure clean water at all times. Another impressive aspect of the Bestway Lay-Z-Spa Hawaii HydroJet Pro Inflatable Hot Tub is that comes with an integrated salt water system. In particular, the salt water system is used to treat the water before being released into the tub for the users. More so, this system provides water that looks, smells and feels great such that you will be spending more time in the spa. You can enjoy the presence of fewer chemicals in the water. Besides that, the Bestway Lay-Z spa Hot Tub comes with a digital control panel with an integrated automatic stop and start timer to monitor the water heating system. What is more remarkable is that it comes with simple and robust user interface that easily qualifies it as a paragon of user-friendly engineering. With just the simple touch of a button, one can be able to calibrate the temperature of the water for a relaxing and comfortable experience. 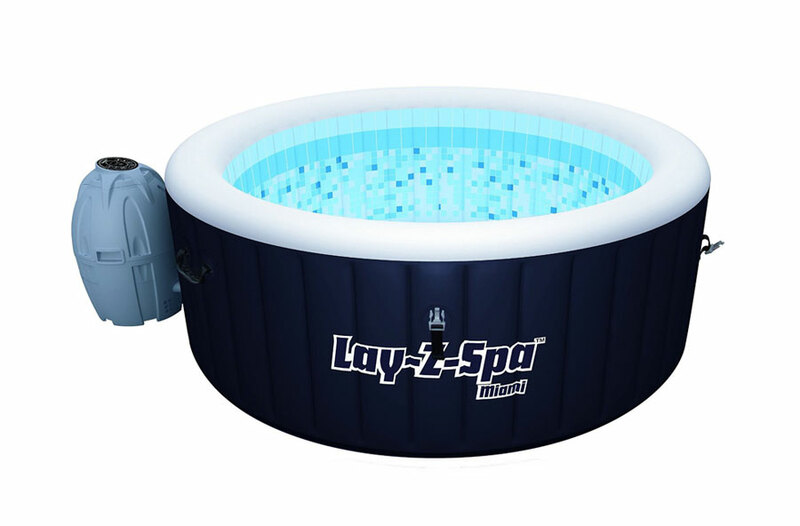 The Lay-Z-Spa air jet Hawaii’s comes with a puncture resistant exterior that is made using TriTech 3 ply reinforced material that comes with a polyester mesh core that is adorned with two layers of PVC for the ultimate strength and durability. On a similar account, the exterior of the tub is designed to provide the ultimate scratch and impact resistance to make ideal for various types of outdoor settings. 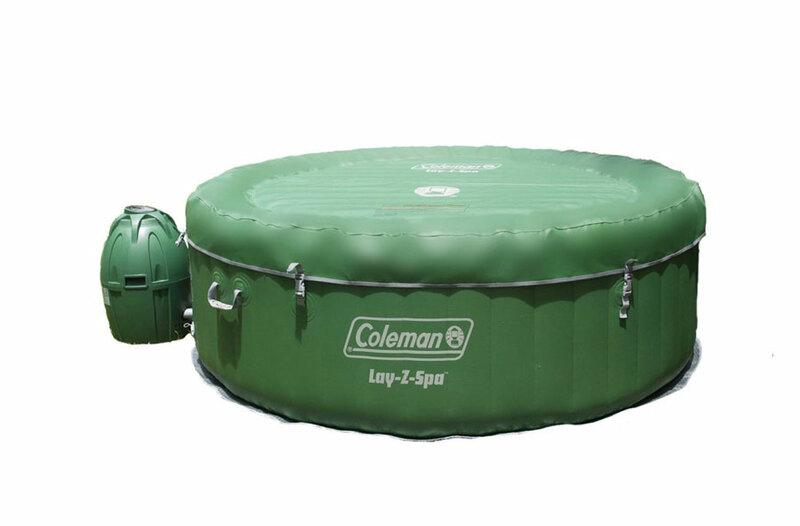 The Lay-Z-Spa Hawaii also comes with equipped with a unique leather cover that is customized with double safety lock clips and inbuilt air chamber for the ultimate insulation. Besides that, it also comes with maintenance and set up guide DVD, pressure gauge, filter cartridge and chemical floater as well. The spa provides a simple maintenance process with the inclusion of the two easy to replace filter cartridges for a refreshing spa water each time. The Lay-Z-Spa Hawaii comes with benevolent additions such as the floor cushioning that is laid on the floor for the ultimate comfort and stability. It also comes with excellent additional features such as the hydro jet nozzles, saltwater filtration system and a robust design for the ultimate value for your unique needs. Furthermore, this hot tub is also equipped with ergonomic handles for convenient portability. This hot tub comes packaged with a useful setup DVD, a simple and practical to follow user guide, along with a filter carriage that is simple to replace. Additionally, it also comes with a chemical floater and a bubble mat to act as a support base. The Hot Tub also features a Digitally Controlled water heater, and a Wireless LED remote control for manipulating the lighting system. Rapid heating system: Approx. 2-3 DegreeF/h. 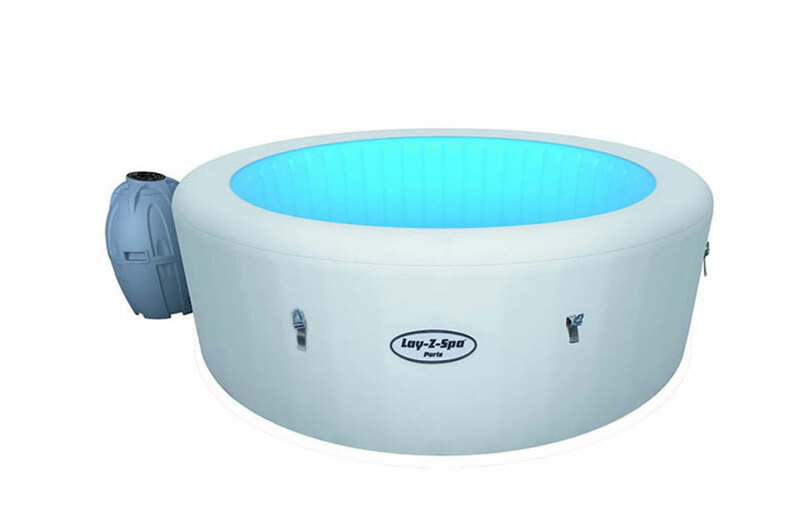 The Bestway Lay-Z spa and hot tub are ideal for those who want a convenient solution for enjoying the water and with enough room for as many as four other people. More so, it also makes an excellent addition to couples who want to share a romantic time or perhaps families with children who like playing in the water. 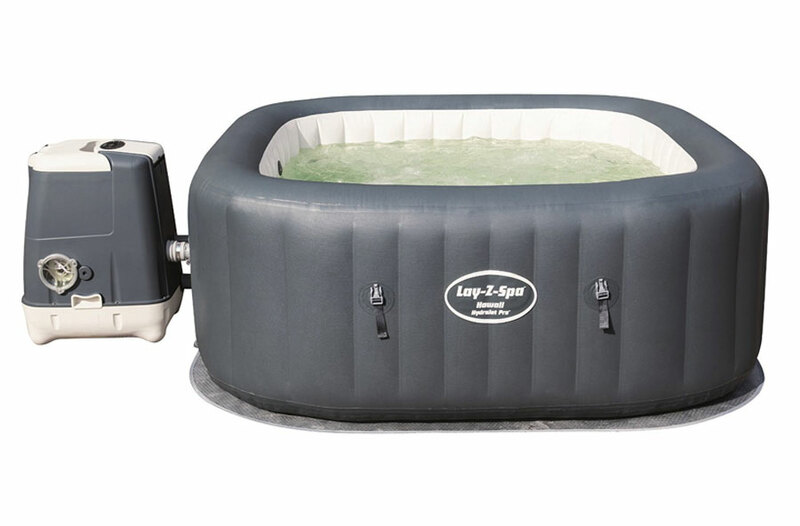 Overall, when taken together, the Bestway Lay-Z-Spa Hawaii HydroJet Pro Inflatable Hot Tub is an excellent investment for your unique needs. This is because the tub is simple to set up and provides sufficient room for as many as four other people to enjoy the water. Besides that, it comes with unique auxiliary features that allow user to enjoy the best of sitting in a hot tub spa. Additionally, the inclusion of saltwater filtration system and digital control panel make it stand out from the conventional hot tub designs. Hi Sue, that is 40 ℃, so about 104°F. This can be used in winter but it depends how cold it get outside. Hi, does the salt water system mean you have to shower after having a spa to rinse the salt water off your body? Plus secondly, are any other chemicals required other than using the salt water system? Lastly, can any sort of salt be used or is it some special blend? Question i have just purchased a Hawaiin lay z spa. Does anyone know if it comes with a pump or do we purchase that seperate. ?